As a part of today’s Ohio Blogging Association Cleveland November Blog Swap, I’m happy to introduce you to Danielle from Namaste Or Should I Go? Today, bloggers from around Northeast Ohio are guest posting on one another’s blogs as a way to get to know others in our blogging community. For a full listing of blog swap participants, please visit Poise in Parma today. Hello Life Lyn Style readers! 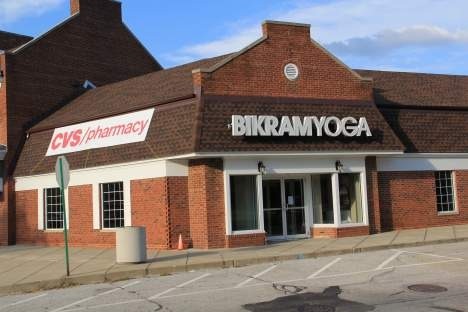 Allow me to introduce myself – my name is Danielle and I’m a teacher at Ohio’s first Bikram Yoga studio, Bikram Yoga Cleveland (http://bikramcle.com/) in Shaker Heights. On blog swap day, Lyn suggested that I write about starting yoga, since it’s something she’s never done, due to fear of doing it wrong, weight trouble, knee issues, and so forth. Well never fear, LLS readers – I’m hear to tell you all about Bikram Yoga, how to get started, and why it’s the perfect form of yoga for beginners! Wait, what? 105 degrees?! And you’re saying this is GOOD for beginners? Please explain. The heat makes you less likely to strain, to pull a muscle, to hurt yourself. You’re more flexible and malleable, just like that fine piece of steel. For beginners, especially those with old injuries, scar tissue, tight muscles, etc that’s a fantastic way to stretch your body without aggravating it. Won’t the class be full of skinny, bendy young people? I’m worried I’ll feel self-conscious about my weight/tummy/legs/<insert body issue here>. Nope! The great thing about Bikram Yoga Cleveland is that because we’ve only just opened, we have a wonderful mix of beginners and advanced students alike. In every class you’ll see all shapes, sizes, and abilities. The heat and structure of the class make it easier to just focus on yourself and not worry about what people are doing, feeling, or wearing around you. Plus, Bikram Yoga is FANTASTIC not only for weight loss, but for building muscle and, especially, improving overall health. It can change your life! And don’t worry if you can’t do all the postures right away – because every class is structured the same, you’ll feel more familiar with the poses and start seeing improvements in balance, strength and flexibility within only a week or two! Besides, in Bikram Yoga it doesn’t matter how flexible you are, how close you can get to the full expression of the posture – as long as you’re doing it 100% the right way, you’re getting 100% of the benefit, regardless of how deep you can go, how long you can balance. Bikram Yoga is for everyone! 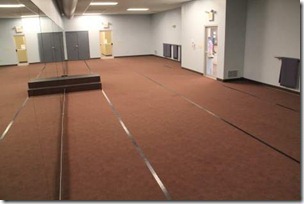 There’s lots of useful information on our website, http://bikramcle.com/. And stop by or call, we’re happy to answer any questions! We’re located on Fairmount Circle by John Carroll University. There’s plenty of free parking in the adjacent lot. I’m so glad you included that picture of the building where Bikram CLE is located – I know EXACTLY where it is located. Now there’s no excuse for me to not check out a class! I adore yoga… for the emotional, spiritual AND physical benefits. I have not practiced Bikram. I appreciate this informative introduction!